Hello ... Hello ... my old friends ... It's great to see you once again! When Louis Clark isn't pulling the strings [literally!] 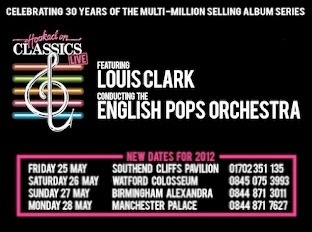 in The Orchestra [former members of ELO and ELO Part II], he is out and about either conducting other orchestras or he is involved with Hooked On Classics - the musical phenomenon he created some three decades ago which has sold over 13 million copies worldwide and has now returned to the live format. ELO Beatles Forever [ELOBF] recommends Louis Clark and Hooked On Classics - LIVE to those enlightened folks who enjoy the music of ELO, Jeff Lynne, Roy Wood, The Move, The Idle Race, 'Brum Beat', The Beatles and related artistes.